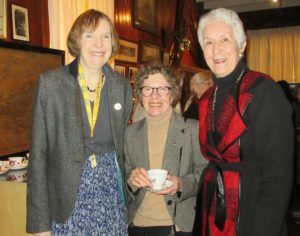 The book launch for “Emily Patterson, The Heroic Life of a Milltown Nurse” by Lisa Smith was held at the Hastings Mill Store Museum December 9, 2017. 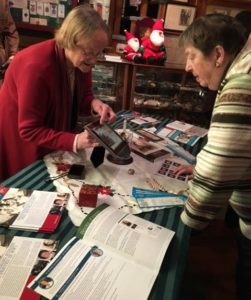 BCHNS was invited to have a display table, prepared by Nan Martin, which featured the Emily Patterson doll, created by Sheila Rankin Zerr and sponsored by Helen Shore. Author, Lisa Smith expressed that the presence of the doll “really felt that she was right there with us”. There were several descendants of Emily in attendance. The author will be making a donation of some of the royalties to the BC History of Nursing Society in appreciation of BCHNS members who assisted with her research G.Zilm, S Zerr, H Shore, N Martin & K Murphy. The donation will assist the Society with further collections of historical papers. Well done Lenore! Thank you. It was a great afternoon! Many thanks to the B.C. History of Nursing Society for being a part!